The service developer uses ThingML to define the components of the HD-Service and implement the logic of those components. State machines are a common formalism to express reactive behavior that needs to react on some events, correlate events, and produce some new events. A state machine-based programming language, and ThingML in particular, is thus a good candidate to implement Kevoree components and write the logic that orchestrates the different ports of this component. This simple, platform-independent service basically outputs a "hello n" every second. This is realized by starting a timer when entering the Init state. On timeout, a timer_timeout message is received, triggering the prints, before it re-enters the Init state. Like in most programming languages, functions are particularly useful to encapsulate code that is called from multiple places, to avoid duplication. print "hello" and error "alert!" The HEADS modelling language has been extended with CEP concepts (See D2.2 for more details). CEP complements state machines and provides more powerful abstractions to handle streams of events, for example to compute the average of the values provided by a sensor on a given time window, or to when some behavior should be triggered when two events happen "at the same time". While this can be expressed with state machines, this typically implies instantiating timers and arrays (to manage time windows), managing different interleaving, etc, i.e. this generates accidental complexity. Those CEP concepts are mapped to the ones provided by ReactiveX. 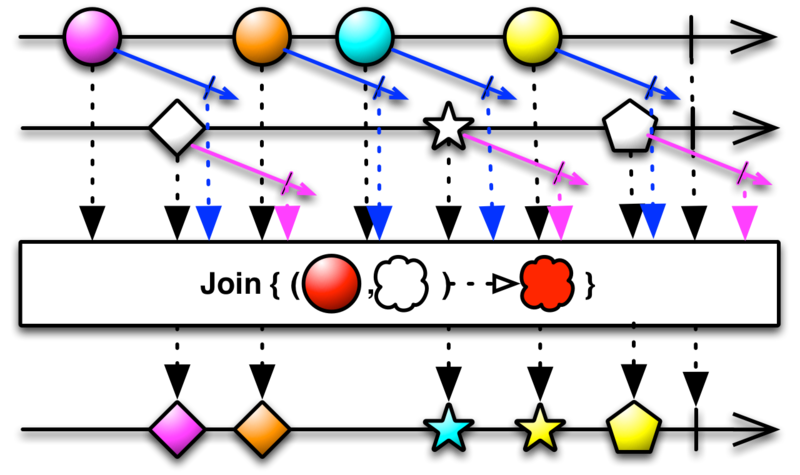 The join operator "combines items emitted by two Observables whenever an item from one Observable is emitted during a time window defined according to an item emitted by the other Observable". See the figure below (taken from ReactiveX documentation) to get an idea of how it works. Whenever a message m1 and a message m2 are received within 100 ms, it will produce a cep1 message. 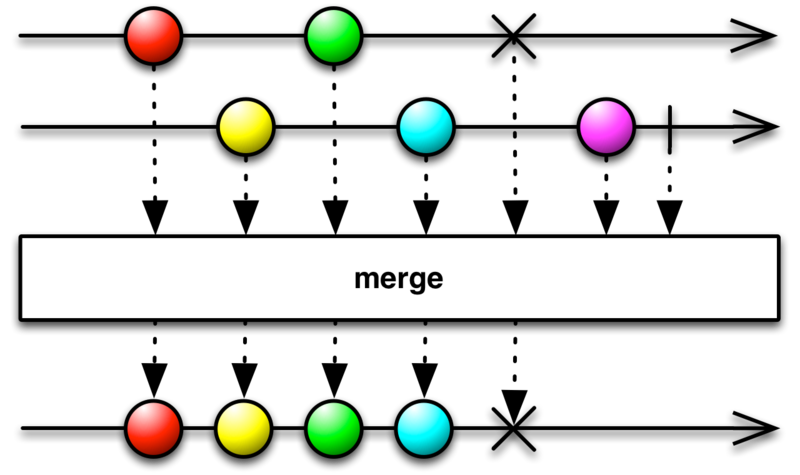 The Merge operator "combine multiple Observables into one by merging their emissions". See the figure below (taken from ReactiveX documentation) to get an idea of how it works. A Filter "emits only those items from an Observable that pass a predicate test". See the figure below (taken from ReactiveX documentation) to get an idea of how it works. 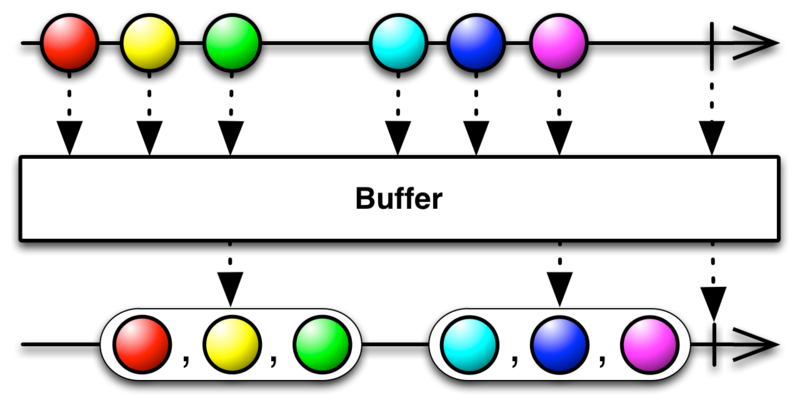 A Window (or Buffer) "periodically gathers items emitted by an Observable into bundles and emit these bundles rather than emitting the items one at a time". See the figure below (taken from ReactiveX documentation) to get an idea of how it works. Those aggregators are typically defined in a reusable libraries that any stream can then use directly. the initialization of instances, with values for all attributes. Those traces appear in light blue in the figure below. the execution of the state machine (which states are being entered/exited, which transition are triggered, etc). Those traces appear in yellow in the figure below. the emission/reception of messages on ports. Those traces appear in green in the figure below. the affectation of variables. Those traces appear in magenta/purple in the figure below. the execution of functions. Those traces appear in dark blue (not present in the figure below). Using @debug "true" and @debug "false" the service developer can finely filter the elements he wants to trace.